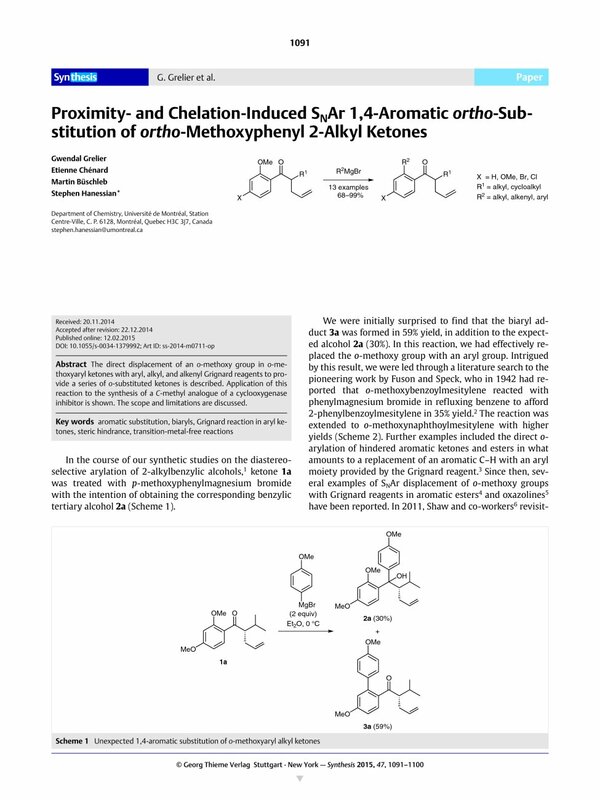 The direct displacement of an o-methoxy group in o-methoxyaryl ketones with aryl, alkyl, and alkenyl Grignard reagents to provide a series of o-substituted ketones is described. Application of this reaction to the synthesis of a C-methyl analogue of a cyclooxygenase inhibitor is shown. The scope and limitations are discussed. Supporting information for this article is available online at http://dx.doi.org/10.1055/s-0034-1379992. 14 See the experimental section. 15 Friedel–Crafts acylation and alkylation of the potassium enolate with allyl iodide was used to prepare all of Grignard precursor 1. 16 Result not shown; addition of LiCl (3 equiv) and increased temperature (reflux) did not change the outcome of the reaction.